Today is the first day of Wildwood’s Popup in Sausalito. We thought it was time to try an urban location with different gardening challenges. There’s quite a few maples like one might expect. Also a more coastal selection of plants that could be unexpected. 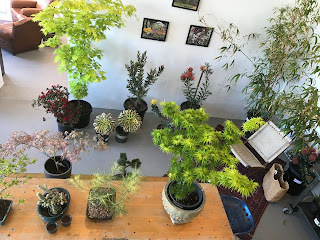 Proteas, aeoniums, ferns, indoor plants, and very cool bonsai. Fall isn't the only season for leaf color. Here's seven great maples for Spring color. Katsura: One of the first maples to leaf out. Orange gold leaves are already open at Wildwood. Sharp's Pygmy: Dwarfs are always the first group to open. Cute green leaves with red tips. Corallinum: Bright shrimp pink foliage is a knockout. Ryusen: Early to open. A cascade of light green leaves is a contrast to all other upright greens. Autumn Moon: Enjoy fall oranges and golds in Spring. Hana Matoi: A combination of light pink and red on delicate lacey leafs. Shindeshojo: Fire engine red color is like New England in fall. 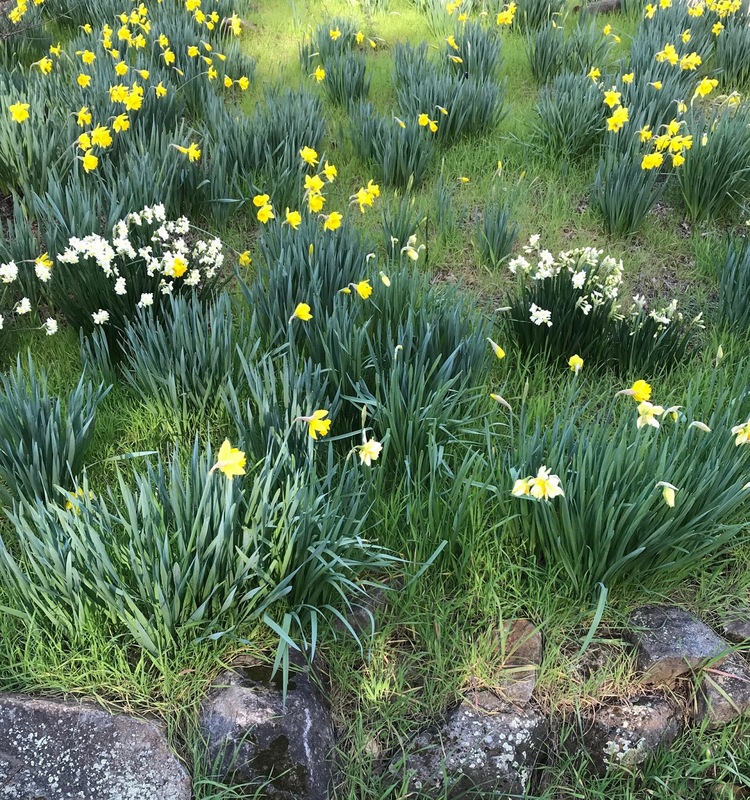 The dawn of spring at Wildwood starts with the Daffodils. 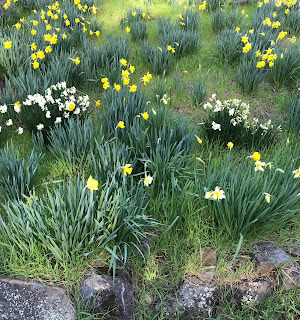 They jump out of the ground and pop open with oranges, yellows and creamy flower bursts. They're a much needed shot in the arm when everything else is still sleeping. Once they open, we know it's only a matter of weeks before the floodgates of spring open. Stop by the nursery, pick a bouquet and daydream about spring! In preparation for this Spring's star studded plant line up, we're rolling out artificial grass in a new display area! 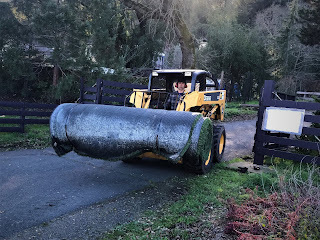 Today's artificial grass is more life like than ever. The lawn look a like is maintenance free [some occasional vacuuming] and provides a cooling contrast to hardscapes. Our rolls come from a football field in San Jose so they're also staying out of the landfill. Weighing in at 3,300 pounds, the 7' x 50' rolls will be tough to maneuver. We have confidence they'll be in place for your Spring visit though. Here's a few fun facts from 2018 at Wildwood. The most popular plant was Daphne odora Marginata. The biggest plant we sold was a 12' tall Fireglow Japanese Maple in a 95 gallon. The most popular Japanese Maple was Pixie. The most popular Dogwood was Cornus florida Cherokee Brave. A new ranch style fence anchors the entrance and we planted over 200 perennials on the highway frontage for spring. In spring and summer, we see plenty of greens and reds, even yellow. Sure, those colors get more intense in fall and really come alive. Orange is a completely new color that screams fall. 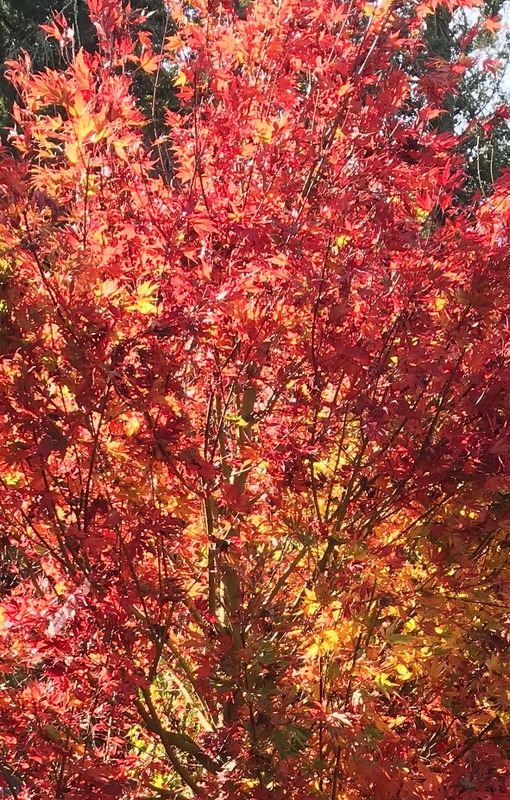 Surprisingly, relatively few Japanese maples show orange in fall. One might guess Orangeola would be one of them - nope. Hogyoku, with its large glossy green leaves goes pumpkin orange. The airy lacey green Brocade leaves also turn a vibrant orange. Glowing Embers has yellows and red in addition to orange but the orange steals the show! This Saturday afternoon, the 20th, Wildwood will offer a workshop on pruning and shaping trees. The focus will be on Japanese maples, but the principles transfer to ginkgo, dogwood, and conifers. The first part of the workshop will be a tour of larger trees in the nursery. Studying mature trees is very helpful when deciding how to shape a younger tree. The second part of the workshop will be a democratic effort to prune a 25 gallon forest green maple. The tree is very dense and twiggy now. Hopefully it will be airy and beautiful after the haircut! The last part of the workshop will be a discussion of container grown plants with particular focus on root pruning. As Wildwood Nursery and Studio Wildwood share anecdotes and stories about gardening in Kenwood and beyond. This is as much about life as it is about plants.